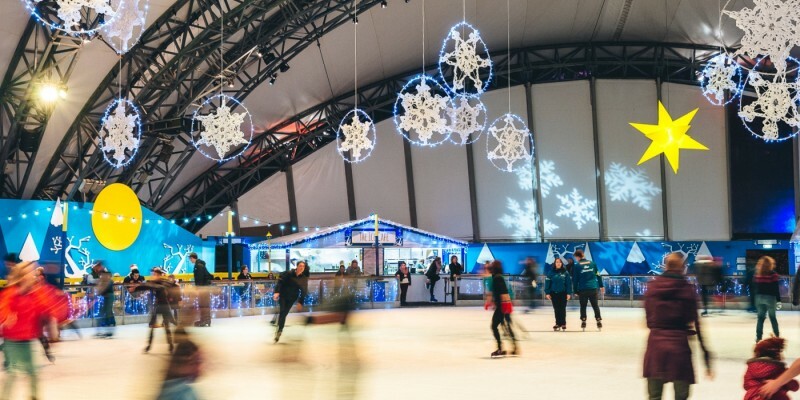 Glistening fairy lights, Christmas markets, ice skating fun and more – Cornwall is packed full of fantastic things to see and do during the festive season. Here are some of our top picks that we think you’ll love. From the famous Mousehole lights which adorn the streets, harbour walls and even the water itself, to Angarrack’s stunning display where you’ll find the twelve days of Christmas, Cornwall’s light displays are truly spectacular. Explore the many different towns and villages and enjoy each of their individual offerings. When it comes to Christmas shopping in Cornwall, you won’t be short of choice! Head to one of the many events taking place, including the Made in Cornwall Christmas Fair, Padstow Christmas Festival, Fowey Christmas Market and many more. Bursting with fantastic food, drink, gifts and more, there’s no better way to get into the festive spirit. Head to the Eden Project this Christmas and enjoy an all new after dark experience. From playful light sculptures, to the magical rainforest where you’ll find different zones of colour and light, or the glowing laser forest in the Mediterranean Biome - if you’re looking for something a little different, this is one not to miss. To top it off, enjoy the stunning light show where colour, lights and music combine to create a fantastic festive celebration. All aboard! Families will love this one-hour return journey from Bodmin. Enjoy a mince pie and seasonal drink before boarding the steam train for the magical trip where you’ll meet Father Christmas and enjoy plenty of festive fun. You won’t want to miss Miracle Theatre’s festive offering! A truly unique take on Aladdin, head to the Princess Pavilion in Falmouth and enjoy the show! Running between 7th December to 5th January, early booking is advised to avoid disappointment.